flat pavement. I ran this course last year in 34:15, a 1 second PR over my Sun Run time and for the year. It was hotter than hell as well last year so I was hoping to have a bit of relief from that this year. The previous night was spent enjoying less than healthy food and beverages accompanied by a great fireworks and even better friends. It seems hard for a night owl such as myself to call it an early night on these fabulous summer evenings. None the less I put a cap on my alcoholic intake and was in bed at a decent hour. It was an early morning feeling once again. I had company this morning as my best friend and his girl were in town from Calgary so I didn't have to worry about the drive. As we stopped off for our morning coffee at Davie and Denman Starbucks, I realized I had forgotten my race number and chip in my truck. I hate back tracking on race day. I must constantly remind myself to relax as I know we will get there with plenty of time for me to get organised and warm up. The weather this morning was perfect for a race. Cloud covered sky with a cool damp feel about the air made me thankful. 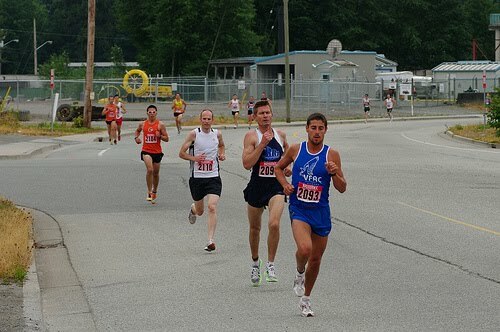 The break in the heat was just what I needed to take advantage of this fast course. 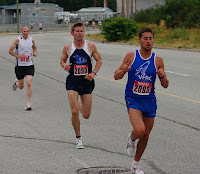 ing, a guy I raced last year in a 5k who put up a good fight and I only just beat. I asked him what time he was planning on running and he said low 33's so I knew there would be a good battle. e competitor whom I had raced last year, he had been working hard and came prepared to this race today! I was so close I could almost touch him and he out kicked me with 20 meters to go! 4th place overall by three seconds in a time of 33:41. The award ceremony was a great success again this year as I won another sweet draw prize. This year I won a pizza party for 10 at Boston Pizza in Squamish. It was great because I had all my team mates and even a few more runners right there that I could invite out for lunch. I sure enjoyed everyone's company and to win something that I could share with so many nice people was even better. I must now train even harder for the Richmond 10k on August 15th because I will not Be out kicked on the line and I deserve a spot on that podium and will fight until my legs blowup to get one! See you all there. Things I hate: Working hard for 10k to be beat by 3 seconds. Things I love: Knowing there's more in the tank next time.